In this post we will look at how to remove the sample projects from the Sitecore Experience Commerce 9.0.2 (Sitecore.Commerce.Engine.SDK.2.2.72). Unlike previous versions, the SDK for 9 update 2 has been cleaned up a little bit. 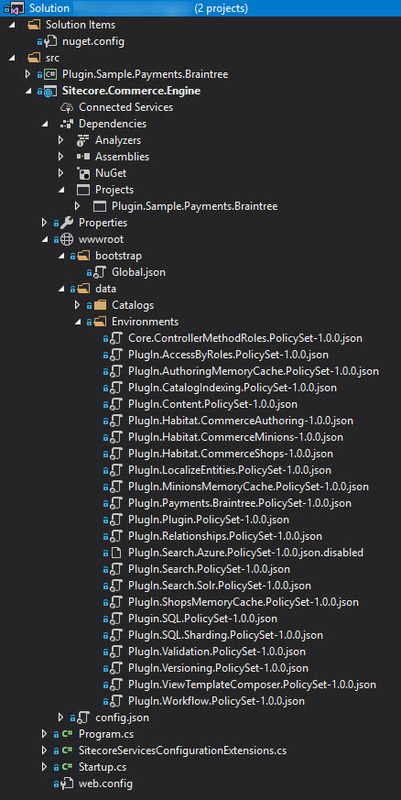 I want to remove Plugin.Sample.AdventureWorks, Plugin.Sample.Customers.CsMigration, Plugin.Sample.Customers.Upgrade, Plugin.Sample.Habitat and Plugin.Sample.Upgrade. For now I want to keep Plugin.Sample.Payments.Braintree. I posted some useful links at the bottom of this blog post. First extract Sitecore.Commerce.Engine.SDK.2.2.72.zip and make a copy of the extracted source. Next, go through all your configs and find where the sample projects were used and remove the config elements. Remove projects from the solution and remove the project references from the Commerce Engine solution. Rebuild and deploy your commerce engine. Once that is done, Bootstrap and Initialize.